Interview with Katherine Heath: Miss Casewell in The Mousetrap. 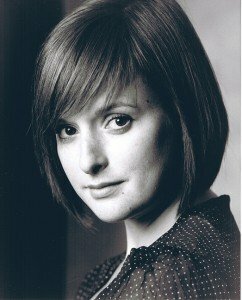 Katherine Heath has appeared in numerous theatre productions since training at RADA, including Alice in Wonderland with the Royal Shakespeare Company and Terms of Endearment (UK Tour). She also starred as ‘Rachel Rogers’ in the ITV series ‘Beech is Back’. At the time of the interview, Katherine was starring as Miss Casewell in the world’s longest running play, Agatha Christie’s The Mousetrap at St. Martins Theatre. The play opened in the West End in 1952. Katherine kindly agreed to answer a few questions about herself and her career. This is a horrendously difficult question. My ‘favourites’ have shifted as I have grown up. As a child my favourite musical and film was ‘The Sound of Music’. It is an epic film and I was (and still am) enthralled by everything. Rogers and Hammerstein’s music is so exciting, Julie Andrews has a voice that seems to jump out of the screen and shake you, and the love story at the centre is beautiful. I will always go back to it. Maybe that has answered your question? However, Sondheim has become a huge part of my life, but I don’t think I could ever decide which one of his musicals was my favourite…Sweeney Todd? If I look at the list of my favourite films, I quickly come to the conclusion that the vast majority of them are my favourite because of the performances in them. When I was younger I loved ‘Big’, Tom Hanks is genius. However, one film in that list ticks all the boxes: direction, script, design, costume, cinematography, music and the performances are all exceptional. It is the exquisite creation from Stephen Frears and Christopher Hampton: ‘Dangerous Liaisons’. I will never get bored of that film. I spent months writing my dissertation on it and I still love it. At what age did you realise that you wanted to be a singer/an actress? I was quite a different person growing up to the person I am now. That sounds like an obvious thing to say as I am sure we all could say that about ourselves, but I was desperately shy and didn’t like to speak to other people much. So I came to acting quite late. I started singing and performing first. I loved to sing but school wasn’t a very happy place for me, so it was hard to push myself to get up and perform. I was also too lost in sport and I wanted to be playing for the country. I really did think I could as well! I loved reading books and plays from a young age and I had an AMAZING English and Drama Teacher called Alfred Bradley who lifted everything off the page for me. He introduced me to the love affair I now have with acting at the age of 15. Two years later, whilst doing my A-Levels, I realised that it was all I wanted to do. I have mentioned him already in the previous question. Alfred Bradley was an astonishing man and a very good teacher. Never underestimate the power of an exceptional teacher. He also directed all the school plays and made the experience very special, even if you were ensemble. To this day I do not know one student in that school who did not respect him. He was caring, creative, unbelievably funny, incredibly bright and gave every student his time and patience. He was there on the press night of my first job out of Drama School. Do you have anyone as a role model that you aspire to? This is a tough one. There are quite a few actors and actresses that I admire for the work they do on and off screen; Tom Hanks has got it right in many ways. There are also many actors and actresses that I aspire to be like; Susan Sarandon and Jodie Foster are extraordinary. Up until recently I was always the youngest in the cast, so I would always look up to the actors and actresses that have been in the industry a bit longer than I have. Not only do they teach you that bit more about yourself and your performance but quite often they stay friends and the support network they provide is invaluable. Actors are a band of people unlike any other and no other group of people will understand you. You have appeared both on stage and on television. Which do you prefer and why? I honestly can’t answer that question. They are so completely different and I don’t think I have done enough screen work (yet!) either to be able to comment. And what about Radio work? What do you like about it? I love every single thing about doing radio plays. Mostly, it is because you get to work with the most amazing actors. My first radio job was something out of a dream. I found myself reading across the table from the late Paul Scofield. I think I forgot the ability to read and speak at the same time. Why do you think the Mousetrap is the longest running show in the world? From your point of view, what makes it special? Is it special because it is the longest running show in the world? Or is it the longest running show in the world because it is special? I have never seen ‘The Mousetrap’ as an audience member so I can’t tell you what makes it special from that respect. I believe that first and foremost it is a good old fashioned whodunnit. There is the inevitable urgency because everybody is trying to figure out who the murderer is. It is a journey that the actors and audience take simultaneously. There are unexpected emotional layers that Christie has put in so there is more to the play than meets the eye. I was surprised when I first read it. Your character is very complex. How would you describe Miss Casewell? Yes you’re right Miss Casewell is very complex. She has so many issues! I can’t really go into much detail without giving the story away. My friends and family that have come to see the show have described me as shifty, cold, abrupt, mysterious, vulnerable, weird. So, yes….a complex young woman. One of the hardest parts I played to date. What do you usually do on your ‘nights off’ from Mousetrap? It entirely depends on how my week has gone. In the past I have said to myself “DO NOTHING”. But I think it is a bad habit to get into every Sunday. I wouldn’t have a life otherwise. I try to make an effort to see friends and family, go for a lunch or supper or go to the theatre. This Sunday I am combining the two and taking my Dad to see ‘One Man, Two Guvnors’ at The National. Who would you most like to star alongside in a play or musical? Another excruciatingly hard question to answer. I watch films, TV and theatre all the time and look at someone and go “I HAVE to be in something with them, NOW!” My top ten dream wish list is ever changing, to name a few: Judi Dench, Anna Maxwell Martin, Ben Wishaw, Claudie Blakley, Patti LuPone, Bernadette Peters (I’ll stop now because the list goes on). Mostly, I love working with people I have huge amounts of fun with who are not only exceptional performers but also friends. So working with them on another project would be fantastic. It would be lovely to work with Anna Francolini, Rosalie Craig and Belinda Lang again. What’s the best part of being an actress? And the worst? The best part is that you are doing the thing you love most in the world. The worst part is the time you spend out of work. It is rubbish! It can be so destructive and a real struggle for so many reasons. There have been quite a few embarrassing incidents; I have dried, corpsed, bumped into furniture, covered for another actor (who was late coming on stage) with appalling improvisation and unintentionally exposed a body part that I didn’t really want exposing. I think corpsing has to be the worst, because once you start it is incredibly tricky to stop and if you are corpsing with somebody else you are absolutely done for. It then becomes more scary and painful then funny because you actually begin to panic and wonder if you will stop laughing ever again. I will never forget the time I was playing Alice in ‘Alice in Wonderland’. The two actors playing Tweedledum and Tweedledee mirrored and synchronised all of their movements and they had choreographed a synchronised comedy ‘trip’. On one of the matinees Tweedledum took the ‘trip’ a little too far and went flying and fell flat on his face. Once the panic had subsided, the wry smirk turned into a grin which turned into a snigger which turned into a guffaw which turned into shoulder shaking painful laughing from all three of us. I think we all hid behind a large prop to smack ourselves round the faces. The actor who tripped was still laughing on the curtain call. I still laugh reminiscing. What other parts would you really like to play? I would love to play Viola in ‘Twelfth Night’, Elvira in ‘Blithe Spirit’, Marquise De Merteuil in ‘Dangerous Liaisons’, Dorothy in ‘Gentlemen Prefer Blondes’, Dot in ‘Sunday in the Park with George’, Mrs Lovett in ‘Sweeney Todd’ to name a few. I am sure everybody says this but I really have not seen much of the world. I went straight from school to RADA and I have always been insanely jealous of some of my closest friends that went off and travelled parts of the world straight after their A- Levels. Sometimes this business puts shackles on you and you are resistant to leave the country in case the phone rings or you simply don’t have enough money to afford a trip. So I would love to see more of the world. On the stage? My ambition is to try and keep acting until I am a mad old grey woman. Imagine you’ve got a whole week off. No work, no singing, no acting. What would you do? Leave the country and turn my phone off. Thank you for this great interview, Katherine and all the best!